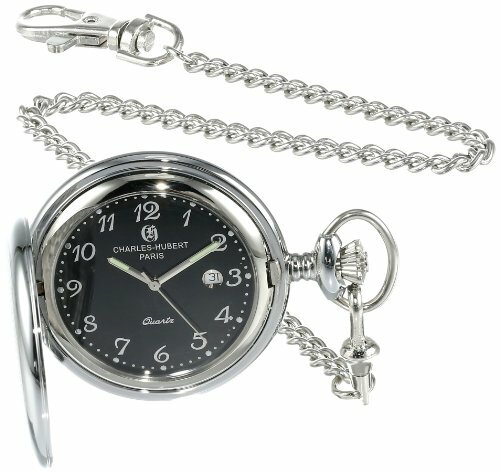 Perfect for engraving, the Charles-Hubert, Paris Stainless Steel Quartz Pocket Watch #3599-B combines an etched crest design on its front cover and rich black dial with the cool elegance of silver-tone stainless steel construction. 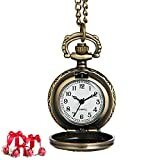 This well-made pocket watch has silver-tone Arabic numerals and hands, as well as a date display at three o'clock. Quartz movement provides reliability, while a matching curb chain lends real retro appeal. Designed to last a lifetime, this Charles-Hubert original arrives in a deluxe blue giftbox.